Black Swan is in the business of making a customer’s home warm and cozy. Whether that means an alternative energy wood or pellet heating appliance or a custom gas fireplace setting; or simply a pretty lamp or cute table Black Swan is committed to creating warm and soothing environments. Why is your company located in Newtown – or why did you decide to grow your business in Newtown? Black Swan began in Newtown since Tom and Carrie lived in Sandy Hook and were able to obtain an original storefront lease in Sandy Hook Center. As their business grew, the potential growth rate of Newtown and surrounding communities were the major factor for remaining in Newtown as they looked for land and buildings to grow their company. How long has your company been in Newtown? 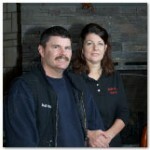 Tom and Carrie Swan are the owners of Black Swan Fireside Hearth and Home for the past thirty years. Why do you think other businesses might find Newtown to be an attractive location for their company? The friendly environment of Newtown and its customers keeps the Swans from looking elsewhere as their rapidly growing business requires more space. The camaraderie of all the different business groups in town help to keep the business growing with all the fresh ideas that are generated from the various meetings.